The Old Farmers Almanac predicts a long cold winter and the storm this past weekend was a gentle reminder that the old man is at our doorstep. This means that it’s time to clean your gutters. Water damage: A clear gutter will direct water away from your home but a clogged gutter with allow water to collect and seep into the foundation and your basement. Loosened gutters: The weight of weight twigs and leaves can cause gutters to detach from your home. Ice dams: We live in an area where homes are susceptible to ice dams. An ice dams forms when water spills over the edge of a clogged gutter and freezes forcing an flowing water to redirect into your home rather than down the gutter. Ice dams can do a lot of damage and the repairs can be costly. Rodents: Clogged gutters can be an inviting nesting place for rodents. If these animals are living in your gutters there is a higher chance that they could find their way into your home. The most cost effective solution is to clean your gutters regularly. We recommend that homeowners clean their gutters at least twice a year, in the spring and in the fall. It is also a good idea to monitor them after extreme weather. Winter Storm Riley Destroys Roofs — We'll Fix It! Winter Storm Riley Blows Trees, Roofs Down — We'll Fix It! 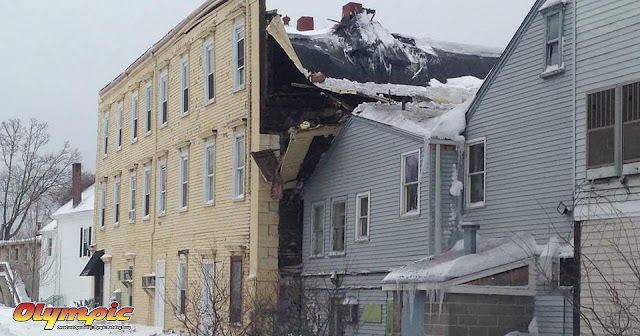 The recent storm surged through much of Northeastern US and left destruction in its path. Some destruction included many fallen trees or tree branches landing on houses, which damaged many roofs. Other damage to the roofs were simply due to the strong 70+ mile per hour winds. Luckily, Olympic Roofing has many crews to help those affected. Olympic Roofing serves Southern New Hampshire, including Manchester, Nashua, and Salem, NH as well as throughout Eastern Massachusetts including Boston, Greater Boston, Merrimack Valley, and throughout the Cape. We will work with your insurance company to help expedite your roof repair, including any damages to your gutters. Call 1-800-535-4312 now for a complimentary consult with an Olympic Technician. Olympic Roofing is based in Topsfield, MA and is Licenced, Bonded & Insured. You can also email us at admin@olympicroofing.com . No annual fee.Deferred payment and interest promotional offers.Advance notice of Home Projects Visa events.Open line of credit for all your purchasing needs.Convenient monthly payments.Quick credit decision. What is the Home Projects™ Visa Card? The Home Projects Visa Card is a revolving, dual-line consumer credit card program geared towards offering our customers exemplary service. This program enables us to offer flexible financing options to you, our preferred customers, on all of our products and services. With a reasonable APR, and financing plans from 3, 6, and even 12 Months No Interest, now repairing, replacing or installing a new roof from Olympic Roofing is not only affordable, but now easy and efficient. Winter Storm Quinn May Destroy Roofs — We'll Fix It! Winter Storm Quinn May Blow Trees, Roofs Down — We'll Fix It! The recent storm, Quinn, will surge through much of Northeastern US and potentially leave much destruction in its path. 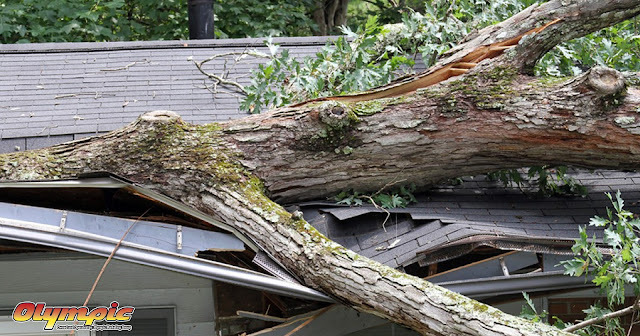 Some destruction may include many fallen trees or tree branches landing on houses, which will damage many roofs. Luckily, Olympic Roofing has many crews to help those affected.